Sony Xperia Z3, the best multi-purpose gadget with huge 20.7-MP camera, 128GB external memory, PS4 Remote Play and IP65/68 certification unveiled in Black, Copper, Silver Green, and White colour option at IFA 2014 in Berlin along with Xperia Z3 Compact and Xperia Z3 Tablet Compact, and Xperia E3. New Xperia Z3 slated to launch globally by Nov. 2014. How ever Sony hasn’t confirmed the pricing and release date so far. Sony Xperia Z2 is available Indian market priced at Rs 49,990 in Black, Purple and White colour option. It will take on Apple iPhone 6, HTC One(M8), Samsung galaxy K Zoom, Nokia Lumia 1020. 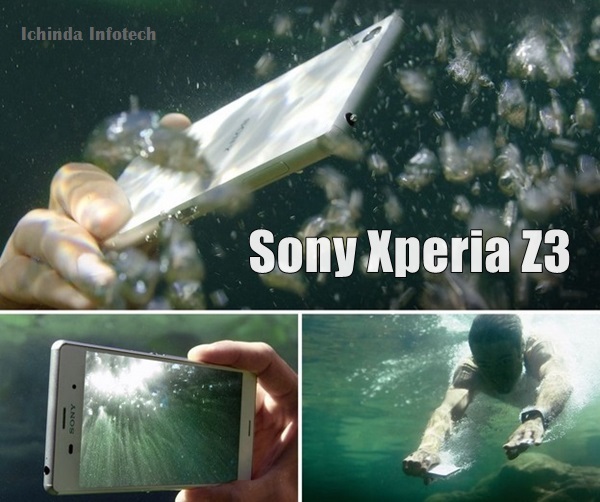 New Sony Xperia Z3 is A water-proof and dust-proof(IP65/68) smartphone allows you take pictures while swimming in water for up to 30 minutes in 1.5 metres deep water. Z3 is faster, lighter and thinner than it’s predecessor Z2 supports 4G LTE, HSPA+, Wi-Fi and Wi-Fi, DLNA, GPS with A-GPS, Bluetooth v4.0, NFC, FM radio with RDS comes with a bigger 5.2-inch full- TRILUMINOS display with resolution (1080×1920 pixels) and X-Reality for mobile picture engine promising world-class multi-media experience and Sony’s intuitive contrast enhancement technology helps you viewing in sharp even in bright sunlight while powerful Android 4.4 KitKat OS and 2.5GHz quad-core Snapdragon 801 processor with 3GB RAM and 16GB of internal storage which expandable up to 128GB via microSD ensures superior multi-tasking. New Xperia Z3 is the first ISO 12800 in a smartphone sporting a huge 20.7MP camera with 4K (Ultra-HD) video recording, The large 1/2.3” Exmor RS™ for mobile image sensor, pulsed LED flash, 8x digital zoom and a 2.2-MP front-facing camera for video calling packed with a powerful 3100mAh battery with battery stamina mode promising up to 19 hours of talk time, up to 740hours standby time, up to 130 hours music playback time and up to 10 hours video playback comes in a dimension at 146.5x72x7.3mm and weight just 152 grams. New Sony Xperia Z3 is a PlayStation® Certified smartphone comes with an innovative PS4™ Remote Play feature which allows you to access your PS4™ games anywhere in your home. PS Remote Play you can seamlessly switch from your PS4 console to your smartphone or tablet – and take your gaming to another room. Just connect your Xperia device to your home Wi-Fi, and play games using the DUALSHOCK®4 controller. Pick up the battle where you left off, or start a new one away from your console. Xperia Z3 promising superior sound quality at noisy bus or a busy shopping centre because it comes with a built-in Digital Noise Cancelling technology that reduces exterior noise by up to 98% when paired with the MDR-NC31EM headset. The technology removes the lower-frequency parts of the noise, preventing the high-frequency part of it from reaching the ear. At last few honest word, the all new Sony Xperia Z3 is the born to revolutionize your photography. What you think? Please open to give your view.